It isn’t just the celebrities who have dreamy looking pantries! 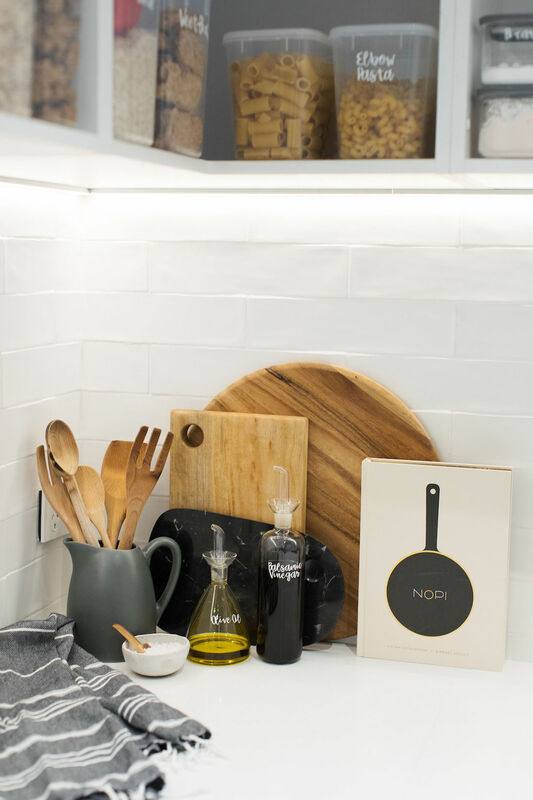 Across Australia, people are embracing the trend of perfectly organised pantries. Not only does an organised pantry look great, it can help prevent food wastage. Unwanted visitors cannot get into foods that are stored in airtight containers, helping to prevent food from spoiling. And, when you can actually see the food in your pantry you’ll be more likely to use it before it expires. It’s easier than it looks to achieve a Pinterest-worthy pantry, here’s how! You don’t have to spend a lot but you will need a range of jars or containers to put your foods into, and I love using baskets to keep smaller items and packet goods organised. You may be able to upcycle old jars as an affordable options or check out some of my favourite products at the bottom of this article. If you opt for plastic, look for containers that are BPA free and airtight to help keep your food fresher for longer. 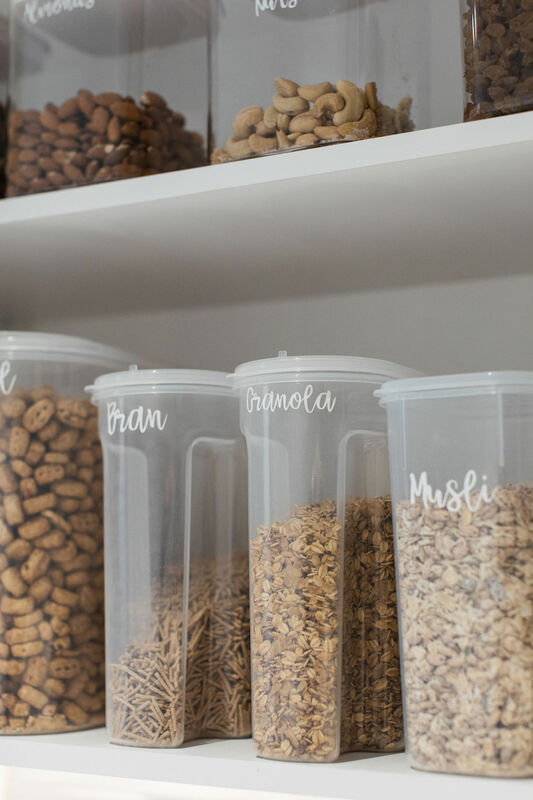 There’s no denying it’s a big job to completely organise your pantry and it can be difficult to get it all done at once. Instead, work out a system that suits you. I found organising one shelf at a time in the evenings once the kids were in bed was manageable and allowed me to get it all done in a week. You’ll be surprised to find just what foods you’ve been storing all these years. Before transferring foods into jars or containers, be sure to check the used by date. Rather than placing foods back where they have always been, take this opportunity to create a more functional pantry. Grouping ‘like’ items together, such as all snacks together and all baking goods together, is a great time saver. 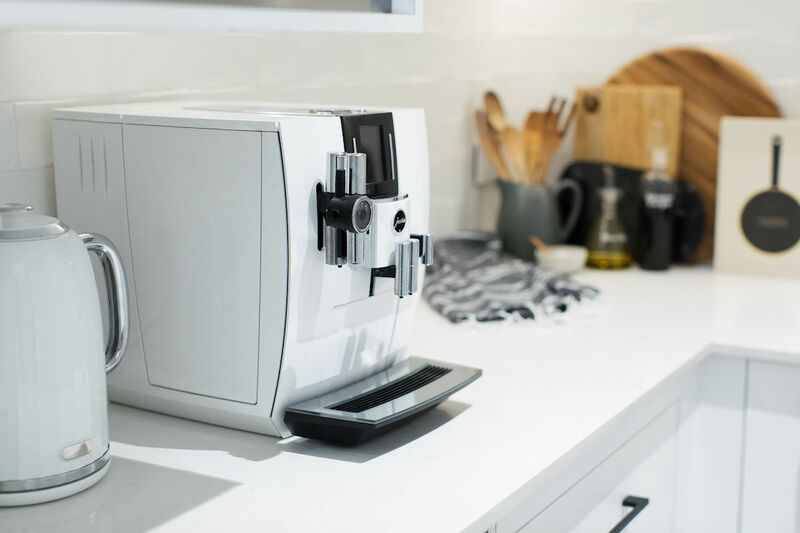 To maximise the available space in your pantry and create the most usable pantry, it’s time to pull out a pen and paper and sketch up a design. Most frequently used items should be placed in shelves or drawers at shoulder height. Least used items should be placed up high and infrequently used foods or appliances can be stored down low. 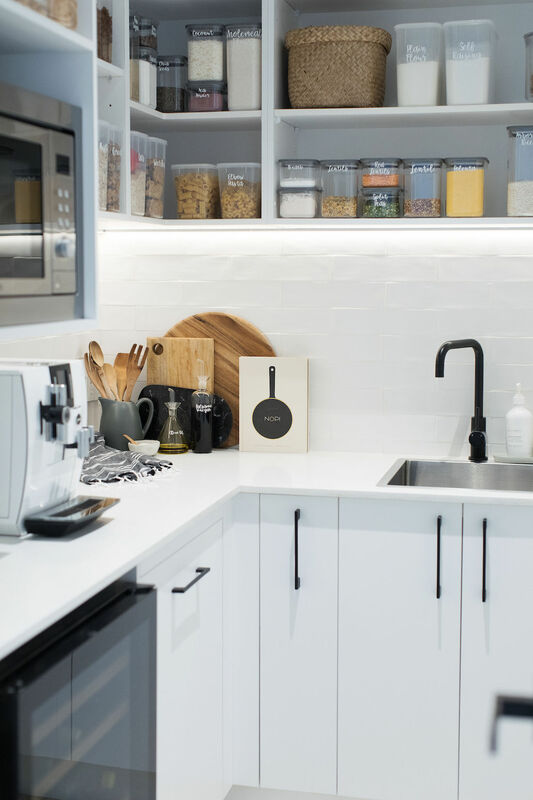 You can also make better use of the space you have with clever storage solutions, such as tier shelves, pull out drawers and behind door hooks. 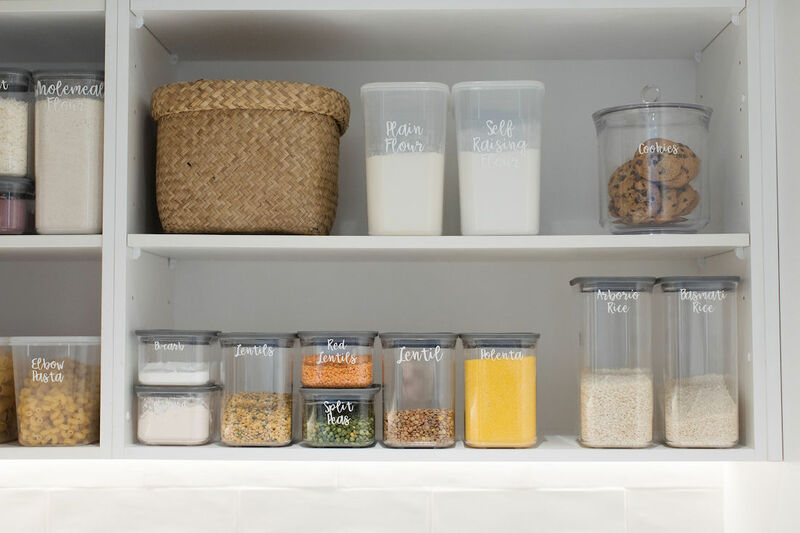 With a plan of attack it’s time to transfer foods into containers and place them in your pantry. Everyday foods should be near the front and overflow items can be placed behind. 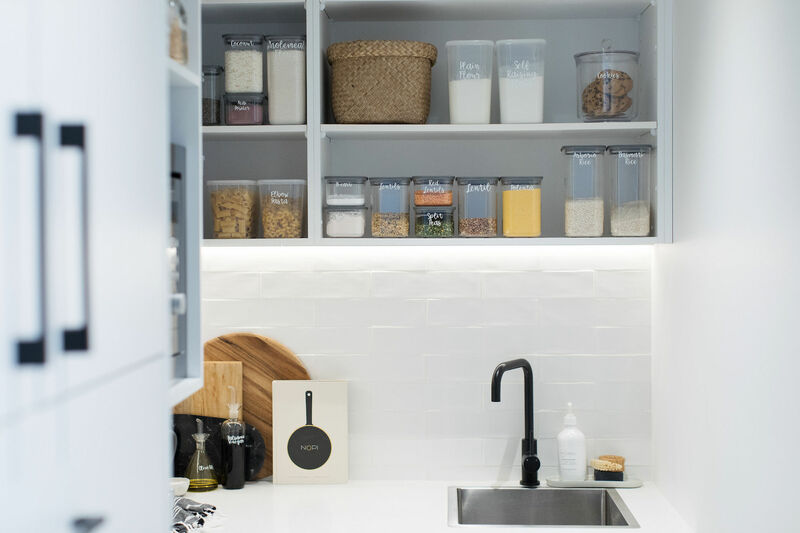 As you begin to fill your pantry you may find additional opportunities to maximise space, such as tapping into free vertical space with simple fold out wire shelves or stackable storage bins. Last but certainly not least, it’s time to pretty up your pantry. 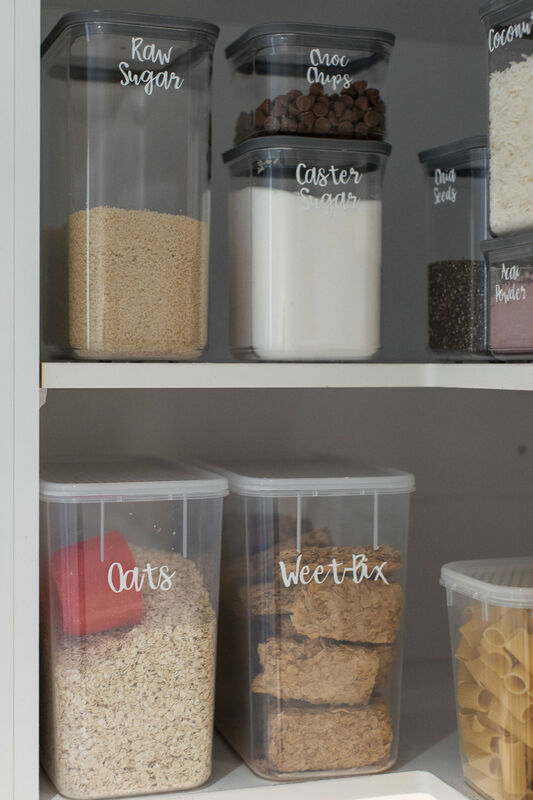 Vinyl labels or blackboard labels are an easy way to instantly make your pantry look fab and more organised. 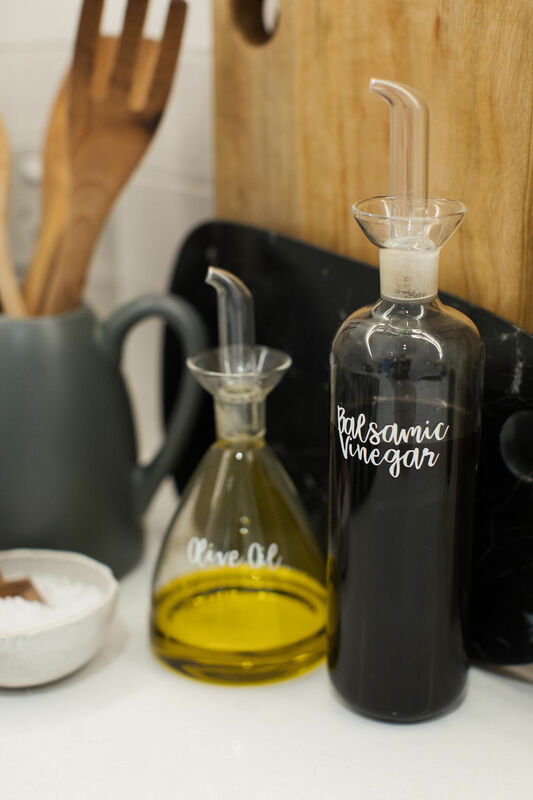 (I used white script vinyl labels from Tipone in my pantry.) Alternatively some people love the look of using bold wallpaper to line the back of shelves – it adds a big pop of colour and is an affordable way to update older pantries. If you have a bench top, I love creating a small styled arrangement and share tips on how to create one here. Previous articleOver half way through our January refresh challenge, have you joined in?